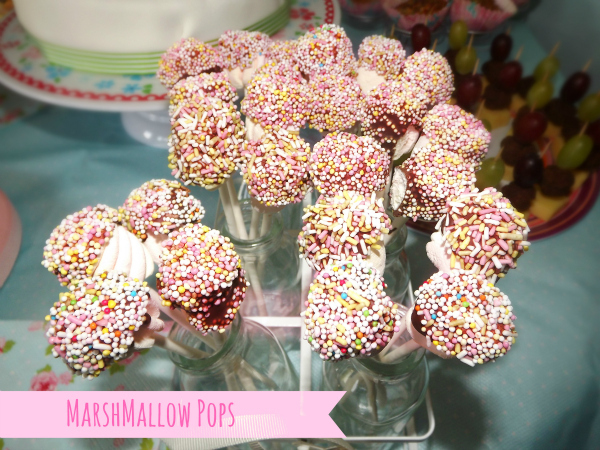 We had Amy’s birthday party last Friday (a week late due to her having tonsillitis) and I thought I’d share a quick and easy way to make marshmallow pops. I had seen them on Pinterest a while ago and thought they’d make a perfect addition to Amy’s birthday buffet. They are really easy to make and were a hit with kids and grown ups alike. Here is how you make them. 1. Melt candy melts or chocolate of your choice over a water bath or in the microwave. 2. Pop your marshmallow onto a lollipop stick. 3. Dip in melted chocolate or candy melts. 5. Stand your marshmallow pops up in a glass or cup and let them dry for a couple of minutes. Have you tried these before? Would they be a flop or a hit with your little person? Terrific idea for party food. Quick, easy to make and kids love them. I envision making the pops would be a fun activity as well! Brilliant idea, these will defiantly get the kids attention! I’ll love to make some of these for my friends son’s birthday party!